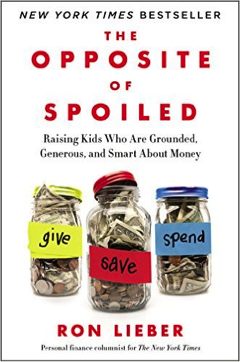 New York Times “Your Money” columnist and author of The Opposite of Spoiled Ron Lieber delivers a taboo-shattering manifesto that explains how talking openly to children about money can help parents raise modest, patient, grounded young adults who are financially wise beyond their years. Quote: “Human quirks and emotions have a profound impact on economic decisions, from governments right on down to individuals” (3). Quote: “Money is central, but it is also a teaching tool that uses the value of a dollar to instill in our children the values we want them to embrace” (12). Notes: One fundamental new challenge for the upcoming generation is social media, which is an “engine of envy” for middle and high school students. From hearing the news and looking around at their own communities, they begin asking money questions that some parents don’t feel comfortable answering. Sometimes parents don’t talk about money with their kids because they fear that talking about money too much will produce money-grubbing kids. Some kids want to make money a focus vs a fetish, but can quickly become obsessed if the subject gets treated like a family secret. Quote: “One way to make sure children know that questions are welcome is to praise their asking them so routinely that posing good ones become a habit” (20). Quote: “And the best way to handle [the question, How much money do you make?] is to explain that we may indeed want to share our salaries by the time they’re in high school, but they first need to learn a whole lot more about what it actually costs to pay for the things that the family has and does” (25). Notes: Encouraging kids to ask questions helps them assert themselves, and reinforce the ideas that questions are welcome. A child’s response to the question, “Why do you ask?” comes from either idle talk or fear of some sort. We need to answer these money questions honestly, since kids usually find out one way or another. Context is more important than numbers, so it’s good if you explain in detail what you spend on. Quote: “So allowances ought to stand on its own, not as a wage but as a teaching tool that gets sharper and more potent over a decade or so of annual raises and increasing responsibility” (46). Quote: [In regards to 66% of 9 year old kids thinking they deserve compensation for their work compared to 36% in 13 year olds] “…a growing awareness that everyone in the family ought to pitch in and a concern that demanding payment would make them selfish or mercenary” (67). Notes: Once a child is old enough to count and ask questions is when you should start giving an allowance, because it helps teach patience. However, an allowance should not be associated with doing chores around the house. Next, you need to decide how much a child should receive each week. After figuring out an amount, create a system for tracking and storing the money (give, save, spend). Then, your child will need to list his/her wants vs needs before going out to buy things. Quote: “Never before has so much been available for so little with so much ease” (73). Quote: “…the idea that there are things that we can borrow instead of buy can free up money to purchase things and experiences that deliver the most joy and the strongest memories” (86). Notes: Lieber introduces a novel way of teaching kids the concept of return on investment called the “fun ratio”–estimate the value of a want based on the hours of fun per dollar. Usually cheaper items end up being the most fun and most lasting. Utilize thrifty spending techniques like coupons, prepaid debit cards, and thrift stores. Society tends to make us compare less with our neighbors and more with A-list celebrities and millionaires; be conscious of the messages you are being exposed to. Quote: “…multiple studies have shown that materialism is correlated with higher levels of depression and anxiety and a range of ills from backaches to drug use” (94). Quote: “Kids often operate under a completely different set of evaluative standards when it comes to relative wealth.” (114). Quote: “Parents have an essential role to play in modeling generosity and researchers have shown that if parents give, kids tend to as well” (119). Quote: “Children are capable of deep, penetrating inquiries about how money touches so much of life” (125). Notes: We should aim to make it an intentional goal to set the example for giving in the area of finances, not only as Christians, but as future parents as well. Good advice for answering tough giving questions from kids: try not to criticize or express prejudice, be truthful, and make ways available for them to participate. I think it’s a great idea to either give money in your kids’ names or have them be able to give the money themselves in person to the charity they pick out! Quote: “Making money makes children feel more grown-up and proves to the adults in their lives that they can do adult like things at much younger ages than many modern parents realize” (151). Quote: “Recognition is nice, but work experience that imparts essential character traits matters plenty” (154). Notes: As time progresses, children are increasingly viewed as not being useful. While stepping away from grueling child labor is most definitely for the better, many children are not taught how to work, which translates to many teenagers not taking on jobs and being careless with money. However, it is also important to assign the right kinds of jobs and chores, as well as set limitations for how much monetary help the child is going to receive. Teaching them to work hard for their money will build character, as well as reinforce the value of hard work. Quote: “One good reason for kids to hang out with people who are different from them is to realize that nobody has a monopoly on happiness and that it’s often great fun to slip into a world that is not like your own” (179). Quote: “The goal is not to make our children feel bad about whatever advantages they have or to shun those advantages as they grow older…What we don’t want, however, are children who have no curiosity about people who are different from them and no understanding of what it might be like to have less” (194). Notes: Exposing children to people of diverse socioeconomic status is beneficial in helping them understand how diverse the world is and how individuals still manage to be happy in many different situations. Only 44% of families report saying grace before meals and taking the time to be thankful for what they have been given. It is important to maintain both perspective and gratitude amongst the fast-paced, materialistic culture in which we live. Quote: “Won’t…requires much greater conviction than can’t” (202). Quote: “One of the most basic and yet emotionally complex trade-offs for adults is spending less now in order to have more money later” (205). Notes: Because children are born without a sense of limits, it is important for the parent to distinguish between wants and needs. Teaching them to value what they have and give to others in need helps them to develop into more selfless, socially aware individuals. However, we also need to assess ourselves and ensure that we are spending money on the right things. Though at times this may be difficult, there are often trade-offs in life.